The auditorium is located in Santa Cruz, the capital of Tenerife (Canary Islands, Spain). This building rises from the ocean as a symbol of 21st century Tenerife, where culture and art are a fortunate addition to the attractive climate and nature that characterize this island. The organ, now part of the Auditorium in Tenerife, crowns the symphonic hall, an element that transforms the building itself into music. Its presence grants this hall, which has some of the best acoustics in the world, the title: "temple of music". Different aesthetic periods have seen different organs. There are gothic, renaissance, baroque, classical, romantic organs... the 20th century, however, has been incapable of creating a model of its own. Through effort, investigation and development, Blancafort OM has built an aesthetically and musically modern instrument. Its configuration has given the musician and the listener a wider and more flexible acoustic dynamic than traditional instruments. Rather than having one source of sound behind the orchestra pit (as is usually the case), the organ is divided into 8 sources that surround the audience (4 on each side of the hall) giving the sound more clarity and presence due to its proximity to the listener. What is truly outstanding is the sound relieve that the organ player can establish with each side of the organ through dialogues, echoes, unisounds, etc., the equivalent of a 5.1 surround sound experience in music. This instrument makes sensitive action a reality, showcased for the first time in a large format instrument. This singular action system does not operate using the regular ON/OFF system, as is the case in most assisted action instruments, but rather through electronic data transmission (ELTEC) and high performance electromagnets (BLANCAFORT) that can reproduce the musician's keystroke with the utmost exactitude, maintaining phrase intention, trill, repetition, etc. Reaction time for these electromagnets is 2 milliseconds due to its innovative design, the same time that it takes a high quality mechanism to reach the tension point that opens the valves. On the contrary, the best ON/OFF electromagnet on the market has a 15ms reaction time, and an electropneumatic system takes 50ms or more!This instrument inaugurates the era of assisted action (not mechanical) for symphonic instruments, where precision does not forgo sound magnitude. A new expressive dimension that has never been seen in the organ before. Derived from the sensitive action system, this instrument also has a control called "variable touch" with which the musician can control the attack-decay emission sound from the tube, in much the same way a flute player would, making articulation and phrasing more flexible and expressive than conventional, existing organs. interpretation of symphonic transcriptions, repertoire pieces, improvisation and new pieces composed for this system. The design of the organ reflects the vanguard spirit of the instrument, as well as its incorporation into the architect's creation. Every visible element has a naturalist and organic style, inspired by the shapes in Santiago Calatrava's building. The facade is an allegory for the basalt formations on the Gomera coast, known as "The Organs". It is made up of six fields with tubes 16' long, set at a 30˚ inclination and reflecting the perspective of the hall. The inclined and suspended arrangement of the tubes (generally arranged vertically) has been an unprecedented technical challenge met by employing special alloys, necessary to avoid certain deformations. The "batalla" or horizontal Spanish trumpets are a characteristic of Iberian organs. 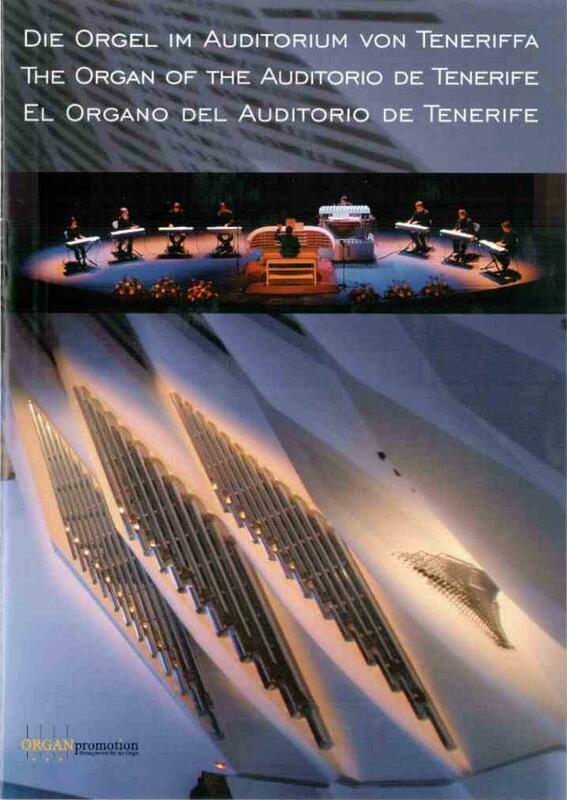 At the Tenerife Auditorium, they are only visible when the organ is in use. It consists of two blocks (one on each side of the hall) that move into the hall thanks to a high precision automatic mechanism that opens the trap door and slides each 400kg block outward. The console, where the organist sits, is the most vivid and visible part of the organ. An "haute couture" piece of modern cabinet work, it boasts a highly complex geometric execution. This singularly lyrical sculpture is inspired by the external forms of the auditorium itself. Its interior houses the most sophisticated traction system in the history of organ making.